CARFAX One-Owner. Clean CARFAX. 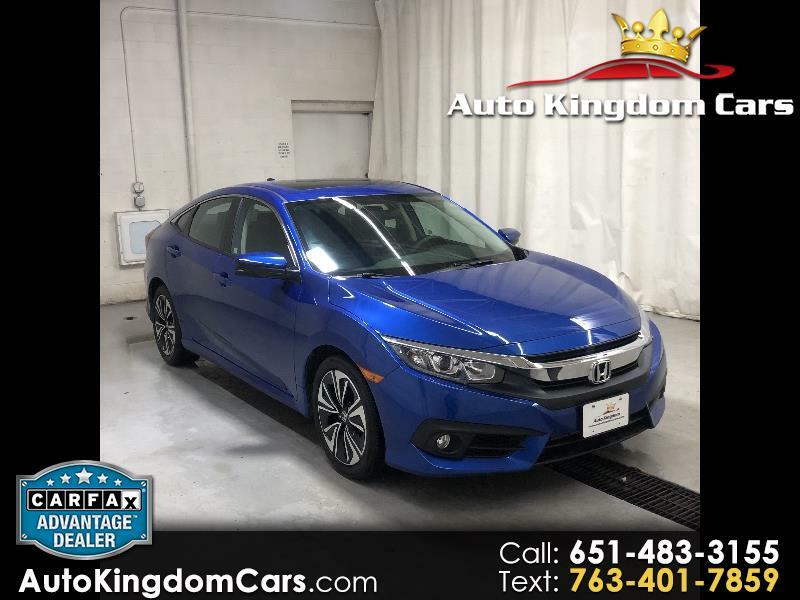 2016 Honda Civic EX-T FWD CVT 1.5L I-4 DI DOHC Turbocharged ***ACCIDENT FREE CAR FAX***, **LOCAL TRADE***, Cloth. Recent Arrival! Odometer is 1571 miles below market average! 31/42 City/Highway MPG Awards: * 2016 IIHS Top Safety Pick+ (When equipped with honda sensing) * NACTOY 2016 North American Car of the Year * 2016 KBB.com Brand Image Awards 2016 Kelley Blue Book Brand Image Awards are based on the Brand Watch(tm) study from Kelley Blue Book Market Intelligence. Award calculated among non-luxury shoppers. For more information, visit www.kbb.com. Kelley Blue Book is a registered trademark of Kelley Blue Book Co., Inc. We sell over 50 cars a month. Please call to make sure the car you are looking at still is available 651-483-3155. We are your #1 customer rated car dealer in the twin cities. NO COMMISION, NO HAGGLE PRICING and NO GAMES makes car buying enjoyable for everyone. We offer financing for all credit situations. We are located at 10841 Mankato St NE, Blaine, MN 55449. Just 1 mile east of Highway 65 on 109th Ave NE. Call Today 651-483-3155. Thank you.